are typically found in the configuration of: record changer, radio section, amplifer section and external speakers.. Most od the "turntables" of a compact stereo are changers, which meas: these allow to stack records onto the changer spindle for automated uniterrupted play. Some units offer added features, such as an extra input (Aux, Tape). Some units have a built-in 8 Track player or cassette deck. A compact stereo is typically a 1970's item. While compact stereos were often less expensive alternatives to a stereo system that at the times consisted of separate stereo components, some of them are actually made quite nicely. The look and feel appeals still today, or shall I say: again, and in adition to playing records, one can connect a modern iPod to it, when a unit that provides an additional audio input, such as Aux or Tape.  Often takes up less space than a fullsized stereo.  Nive vintage look, feel and sound.  Usually provide more output power than "portable stereo changers".  Sometimes not made as nicely as separate stereo componerts.  Many uits do not have a lot of output power or quality speakers to match the sound of an expensive stereo system.  Stereo Amplifier with quasy qudraphonic speaker output - about 2 x 15 Watt RMS - Sounds Great!  Recording Output to transfer records and 8 tracks. Description: The here shown compact stereo was made by TOPP electronics and sold under the Juliette name. 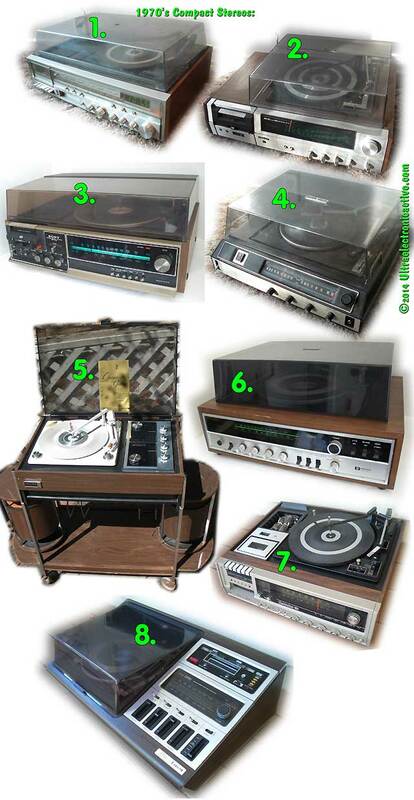 It features a record changer, an 8 track player and a radio section with stereo amplier. It was restored to fully and reliaby work again. The 8 Track Tape player is of high quality with a durable AC synchronus motor (the longest lasting!). It should also be mentioned that the 8 Track has an interesting historical feature: The track indicator (Track 1-4) displays each of the 4 numbers at the same spot providing an early "digital" display - interesting to watch! The unit features recording outputs so that the unit could be used to transfer records or 8 Track to a different recording format, such as the analog line level input of a computer for digital recording. The record changer of this unit plays records of all 4 speeds: 16, 33, 45, 78 at all sizes: 7" 10" 12" and allows to stack records for automated uninterrupted play. The radio section is not the greatest in the world, but receives local stations well. I would estimate that this unit probably was made between 1973 and 1975. Work performed to present this machine in excellent and fully working condition: Full Restoration of the record changer: De-greased and re-lubricared all mechanical parts - which inclcuded rework of all drive parts. Upgraded allligting with LED's (so that they will never be in need for replacement), Completley refurbished the cpastan of the 8 track, Installed a new drive bet, Performed lubrication of all mechanical parts. All potentiometers and swtiches, trimpots, and contacts, including the tuning capacitor deoxydized and lubricated, FM fornt end alignment, Full functional test and pyhsical cleaning a detail work. If I woudl bill for actual work time spent: $450! Lot: "Topp" Elctronics manufactured Juliette compact stereo system, model number: 8TR-90X as described above with new phono stylus (LP/78). Speakers available at extra cost (so that you don't have to pay for shipping speakers out to oyur location, which may get expensive), dust cover not orignal and does not fit perfectly, has cracks - included for free - e-mail me and I will be gald to e-mail photos of the unit with dust cover.  Quality Amplifier with 2 x 6 Watts - Sounds Great!  Recording Output to transfer records, etc. RECORD CHANGER: Speed slector:, 16, 33, 45, 78 RPM, Operation lever: OFF, Man/ON, (Auto Record Size Selector) Rear Panel: Switched AC outlet. 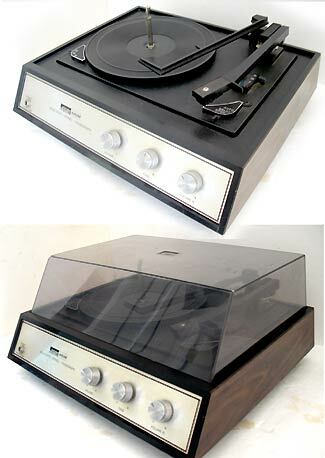 Description: The here shown Receiver and Record changer were made in the the early/mid 70's in Japan by Panasonic. It is a mini system whose size (16 1/2" x 9") and features are kept to a minimum but yet constructed with highest quality materials and to last: wooden casing with metal frame and metal front plate equalling expensive stereo equipment form the 70's. The Record Changer mechanism is British made and a 4 speed record changer with flip-over stlyus for LP and 78's. The radio section of this unit is a qualiuty 3 tuning circuit FM/AM stereo tuner and receives even difficult stations well. It was repaired and the record changer restored to fully working condition. The unit features recording outputs so that the unit could be used to transfer records different recording format, such as the analog line level input of a computer. The unit works and sounds great! Work performed to present this machine in excellent and fully working condition: Restoration of the record changer: De-greased and re-lubricared mechanical parts. Performed lubrication of mechanical parts. Receiver: Repaired, then: All potentiometers and swtiches, trimpots, and contacts, including the tuning capacitor deoxydized and lubricated, Full functional test and pyhsical cleaning a detail work. Lot: Panasonic stereo set: model numbers: RE7670 Stereo Receiver and RD7673 4 speed mini record Changer, as described above with dust cover, good used phono stylus. 4) Refurbish the amplfier/electronics Rpelaces ALL electrolytic capacitos of the unit, so that they will be all new, rendering the unit in relaible working condition for years to come. Capacitors currently still work,, but are older than their life expectancy, so should be replaced - as with any equipment of this age - to give this unit long term relaibility. Cost: Adds: $175.  Terminals and selctor switch for 2 speaeker pairs. Description: The here shown Record changer stereo receiver was made in Japan for Columbia Records and was branded Masterworks. It uses highest quality materials: wooden casing with metal frame and metal front plate equalling expensive stereo equipment form the 70's. It was made in about the early/mid 70's and features a British made 3 speed record changer with flip-over stlyus for LP and 78's. It plays records at 3 speeds: 33, 45, 78 at all sizes: 7" 10" 12" and allows to stack records for automated uninterrupted play. The radio section of this unit is a qualiuty 3 tuning circuit FM/AM stereo tuner and receives even difficult stations well. It was repaired and the record changer restored to fully working condition. The unit features recording outputs so that the unit could be used to transfer records different recording format, such as the analog line level input of a computer. The unit works and sounds great! Work performed to present this machine in excellent and fully working condition: Full Restoration of the record changer: De-greased and re-lubricared all mechanical parts - which inclcuded rework of all drive parts. Performed lubrication of all mechanical parts and re-worked drive surfaces. Rpelaced the cartridge - it coems with a new stylsu.Radio/Amplfier section: All potentiometers and swtiches, trimpots, and contacts, including the tuning capacitor deoxydized and lubricated, Full functional test and pyhsical cleaning a detail work. 4) Refurbish the amplfier/electronics Rpelaces all 28 electrolytic capacitos of the unit, so that they will be all new, rendering the unit in relaible working condition for years to come. Capacitors currently still good, but are older than their life expectancy and should be replaced - as with any equipment of this age - for long term relaibility so that it will last. Adds: $150 (discounted: usaually a $200 job).  REFURBISHED for trouble free operating for decades to come! Description: This system is a 3 speepd record changer ( 33, 45, 78 RPM) with built-in amplifier and a pair of speakers. The record changer was made By BSR in Great Britain. The amplifier's features volum e controls and a tone cantrol. It has about 2 x 1Watt output power and a headphone jack. This system sounds resonably good.  Record Changer chasis made by BSR. Work performed to present this system in excellent and fully and reliably working condition: Restoration of the record changer: De-greased and re-lubricared all mechanical parts - which inclcuded rework of all rubber parts. New stylus installed. All potentiometers and swtiches, controls and contacts deoxydized and lubricated, Full functional test and pyhsical cleaning a detail work. Lot: Montgommery Ward record changer stereo system with dust cover and new stylus as described above. OR: Quick Check Out Shopping cart button below avaialbe for purchase this changer as described in "lot" with speakers. The will bill about $300 total ($199 stereo + $25 speakers + about $75=Shipping DEPOSIT; Overpayment refund when actual shipping cost calculated). Payment processed through PAYPAL. With Payment I will: pack, then calculate actual shipping cost to your ZIP code (within USA only! ), refund the shipping cost over payment (if any), SHIP and e-mail tracking number. Restrictions apply - so: I may cancel this purchase and refund. If need to approve shipping costs, before I ship, please use: Buy/Inquire instead. Please READ and agree to All details before proceding here. 2-6 Weeks Lead Time - Price Range: Fully restorred typically: $350-$650. The goal with my work: to bring these compact stereos back as close as possible to original specifications and to provide reliably working condition for decades to come. This takes hours and hours and HOURS of paistaking detail orineted work. Thus prices based on the amount of time and parts needed (some are quite hard to find! - which again takes time!) to achieve this goal. Shop time to refurbish equipment to order (applies to ALL units shown in this section!) is in SHORT SUPPLY, so I may not be able to serve you very quickly, especially during late fall, winter and the first two months of the of the new year. Rushing it and vintage audio equipment, or pushing for "discount prices" DO NOT GO TOGETHER! It takes as much time as it takes. If needing to rush: Please buy "AS-IS". Thank you! - I do not compromise on this, as my goal is to provide quality products in every detail. Inquire for Details and larger Images --> Please refer to item nubers and type of unit listed in picture ! EXAMPLE: "Compact Stereo # 51 " . 51. Sears compact stereo with 33, 45, 78 RPM record changer, cassette recorder, 8 track recorder and AM FM stereo radio section. This is a full blown stereo - quite luxurious! 52. Meriton Compact Stereo with 33/ 45 /78 RPM record changer, cassette recorder and AM FM stereo radio section. This is a full blown stereo with tape recording output. 53. 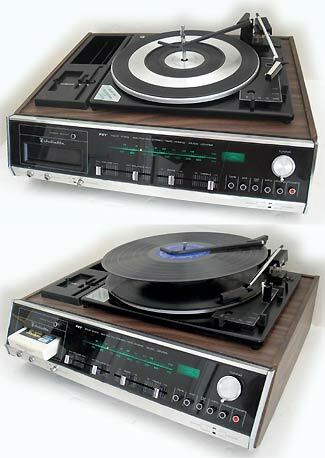 SONY HP-179A compact Stereo with 33, 45, 78 RPM record changer, Cassetee recorder and AM / FM stereo radio section. This unit has an Tape input and a tape recording output. 54. Genral Electric USA made compact Stereo with 33, 45, 78 RPM record changer and AM / FM stereo radio section. This unit has an AUX inout and a tape recording output. 55. Early 1970's Zenith Circle Of Sound USA made compact Stereo with 33, 45, 78 RPM record changer and AM / FM stereo radio section. comes with original speakers and cart (can be removed form cart and shipped without it). 56. Hitachi quality Record Changer Receiver in wooden casing. 16 / 33 / 45/ 78 RPM record changer with Magnetic cartridge, HiFi stereo amplifier / stereo high quality (3 tuning circuits!) radio section. - SOLD! 57. 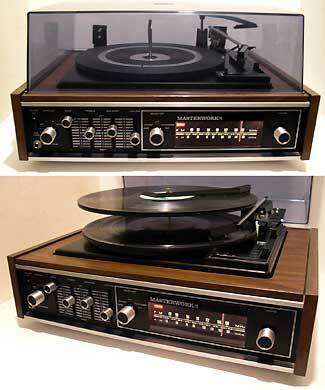 Radio Shack Compact srereo, model: Clarinette, with 33 / 45 / 78 RPM record changer, 8 Track and Cassette recorders. Realisitc Nova spaekrs avaiable as well, which is an upgrade to the speakers with which this stereo originally came with. 58. USA Made Zenith Compact stereo with 33 / 45 / 78 RPM record Changer, 8 Track recorder and stereo radio section. Original Zenith Allegro Speakers , that match this stereo, availabe as well. And. I have more units simil aro to above not listed yet..